Energize your next marketing push by generating the kinds of sales leads most concerned with electricity and safety: electricians. Buy contacts by downloading our electrician email database, which is ready for you to grab and use right away. Conduct better B2B outreach today! Do you want to market to a knowledgeable, specialized group of professional contractors and individual businessmen all with the same expertise? Well, with this product, you can break through the clouds of foggy marketing and strike at a targeted B2B group: electricians. This is a spread-out, powerful group of contractors who make daily purchasing decisions about training, tools, and an assortment of products to help them conduct their jobs in a more efficient and safer way. Help them stay organized and get the job done with your products. Reach out to a network of contacts with our electrician mailing list today! Keep the lights on and your business humming along by connecting with the types of leads who will buy and use your product. With this one electrician email list, you'll have all of the accurate information you need to make connections. 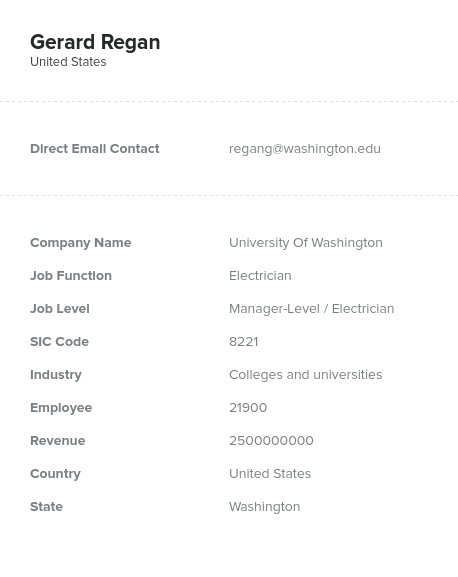 You'll get electricians' emails for a mass email marketing campaign. You'll have phone numbers for a cold-calling campaign. You'll also have postal addresses, real names, and company information for direct mailings. Our electrician email list is a ready-made product that can simply allow you to do more and reach better contacts. Buy our email database of electricians and recharge your marketing outreach today!